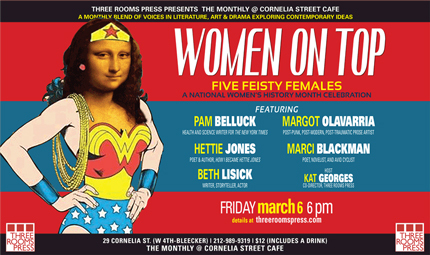 Friday, March 6, 2015, 6 p.m.
To celebrate National Women’s History Month, Three Rooms Press presents “WOMEN ON TOP: Five Feisty Females” at Cornelia Street Cafe Friday, March 6 at 6 p.m. The event features readings and performances by five passionate, irreverent, and intense women writers, artists, and cultural leaders including poet and activist Hettie Jones; New York Times health and science writer Pam Belluck; post-punk, post-modern, post-traumatic prose artist Margot Olavarria; poet, novelist, and avid cyclist Marci Blackman; and writer, storyteller, and performer Beth Lisick. Three Rooms Press co-director Kat Georges hosts. Doors open at 5:45. Admission is $12, which includes a free drink. Cornelia Street Cafe is at 29 Cornelia Street, in the West Village, between W. 4th Street at Bleecker (http://corneliastreecafe.com/). PAM BELLUCK is the health and science writer for The New York Times and author of the nonfiction book Island Practice. HETTIE JONES is a poet and former chair of the PEN Prison Writing Community, as well as author of the acclaimed memoir How I Became Hettie Jones. MARGOT OLAVARRIA is an essayist, translator, and activist. She was bass player in The Go-Go’s and Brian Brain. She holds a PhD in Political Science from New School. MARCI BLACKMAN is a poet and award-winning novelist (Po Man’s Child, Tradition), and an avid cyclist who co-wrote BIKENYC: The Cyclist’s Guide to New York City. BETH LISICK is a writer, storyteller, and actor. Her books include the memoir collection Yokohama Threeway and The New York Times bestseller Everybody Into the Pool. The event is part of THE MONTHLY series at Cornelia Street Cafe, hosted by Three Rooms Press, which brings together writers, artists, philosophers, and scientists to delve into a different theme each month from divergent perspectives. Past themes have included conspiracy theories (on the 50th anniversary of JFK’s assassination), Code Poetry, an exploration of poetry that simultaneously works on multiple levels and languages, and notable literary figures including Charles Bukowski and William Burroughs.